CHAM PHOENICS - пакет программ компьютерного моделирования в области гидродинамики, теплообмена, химических реакций и их индустриальных приложений. MOFOR (MOving-Frame-Of-Reference) models flows induced by bodies in motion. Uses for MOFOR range from the study of rotating machinery to the air flow over a ski jumper to help optimise posture for the reduction of drag and therefore maximise jump distance. PARSOL (PARtial SOLid) enables PHOENICS to provide accurate flow simulations without the need to create time consuming unstructured grids. This makes PHOENICS accessible to the non-CFD expert as it obviates the need to learn the tools to create such grids. A guaranteed automatic convergence algorithm has been developed and included in the latest version of PHOENICS. Most CFD-code (ie not just PHOENICS) users have, until now, had to adjust convergence and relaxation parameters to achieve a converged solution. This development removes the need to run a case overnight to find that it shows no sign of convergence the following morning. PHOENICS PLUS (GROUND coding) allows users to create customised environments to suit specific needs. Where an organisation does not have the resources, or inclination, to undertake development CHAM consultants will use PHOENICS PLUS to carry out the necessary work. If problems involve unique or ground-breaking physics this may not be included in the core of PHOENICS. 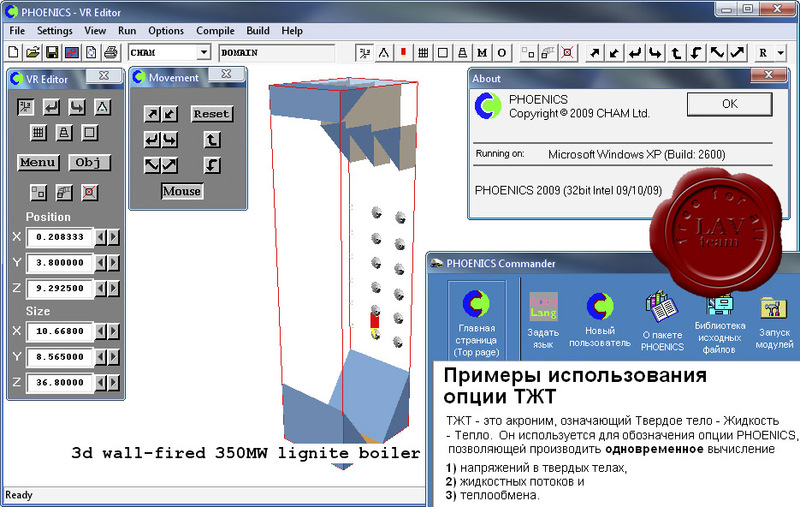 PHOENICS PLUS allows new physics to be added to augment or replace standard definitions. IN-FORM achieves this on a case-by-case basis whereas additions made using PHOENICS PLUS are available for all cases.